Photos and video from a wedding, a graduation party, several Christmas celebrations, and other memorable moments . . . like prison visits. They're all part of a pretrial evidence list in the pending racketeering case against mob boss Joseph "Uncle Joe" Ligambi and 10 associates. Filed late last month by the U.S. Attorney's Office, the 22-page document is a road map of an investigation that began more than a decade ago and culminated with Ligambi's indictment and arrest in May 2011. The evidence list comes as prosecutors and defense attorneys continue their pretrial sparring in the latest racketeering case against Philadelphia's beleaguered and often dysfunctional crime family. In the last two weeks, prosecutors have filed a motion seeking an anonymous jury for the October trial while the defense has sought to have repeated references to the violent history of the Philadelphia mob eliminated from the 52-count indictment. Contending that none of the defendants has been charged with a violent crime, Ligambi's lawyer, Edwin Jacobs Jr., argued that references to past mob violence will "instill fear in the jury and lead them to the unreasonable and impermissible conclusion that [the defendants] . . . are guilty of crimes far more heinous than any of those charged." Prosecutors countered that Ligambi and his codefendants are "beneficiaries" of the Philadelphia crime family's bloody history. "The mob has no moral authority," prosecutors wrote. "Its entire power is based on violence and its capacity to intimidate." An anonymous jury is necessary, the government contends, because of that violence and the potential for jury tampering. Trial Judge Eduardo Robreno has yet to rule on either issue. A hearing on those and several other pretrial motions is set for Aug. 9. The evidence list, expected to be expanded before trial, provides a look at some of the courtroom weapons the prosecution intends to use. It includes FBI and Philadelphia Police Department video surveillance footage taken outside restaurants where mob Christmas parties were held in December 2005, 2006, and 2009; video surveillance of a graduation party at a local restaurant that Ligambi hosted for his sons in 2003, and photos and video from Anthony Staino's posh wedding reception in the Curtis Center in 2009. Surveillance photos were taken as the 300 invited guests arrived at the September wedding reception. The government also subpoenaed photos and video taken by the wedding photographer. Prosecutors also hope to use photos and video taken by the Pennsylvania State Police in a Delaware County investigation in 2007 that targeted mob associate Louis "Bent Finger Lou" Monacello and a dozen others. Monacello, indicted with Ligambi, is now cooperating with the government and is expected to be a key witness in the racketeering case. Described as a major operative for codefendant George Borgesi, Monacello was a frequent target of government surveillance. He also was picked up on a video shot in September 2009 by Fox 29. The video, now listed as evidence, has been aired several times in reports by Fox 29's Dave Schratwieser. It shows Ligambi waving his arms and apparently berating Monacello. To date, no one has indicated what they were discussing that morning. That could change when Monacello, 43, testifies. Other evidence in the prosecution's trial arsenal includes video poker machines and cash seized in raids by federal, state, and local authorities between 2001 and 2009; bank and accounting records; IRS forms and tax returns; and the testimony of cooperating witnesses and alleged extortion victims. Ligambi, 72, is charged with heading a racketeering enterprise that generated cash through illegal gambling, loansharking, extortion, and the control of video poker machines. He is also charged with defrauding the Teamsters union through a no-show job with a South Philadelphia trash company. Ligambi was allegedly paid $1,000 a week for nearly eight years and also used more than $200,000 in medical and dental benefits provided by the union for himself and family members. Prosecutors scoffed at Jacobs' contention that the case was built around nonviolent crimes. "An ostrich making this claim would blush through the sand," they wrote in a motion responding to the defense claim. "It is axiomatic that extortions are crimes of violence." Jacobs' argument, however, is built around a comparison to other mob cases in which the charges have included murders, attempted murders, and aggravated assaults. Also on the prosecution's evidence list were phone records, photos, and other documents linked to Borgesi's stay at a federal prison in Beckley, W. Va., after he was convicted in 2001 on racketeering charges. The list includes several references to Anthony Aponick, who was an inmate with Borgesi between 2001 and 2003. Aponick, a convicted bank robber with ties to the New York mob, is believed to be cooperating with authorities and is a potential witness. 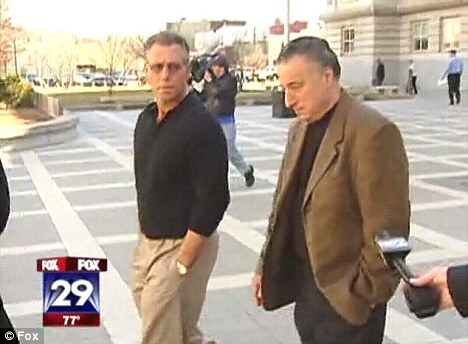 After he was released from prison in 2003 Aponick came to Philadelphia where, according to sources, he met with Monacello and others at Borgesi's behest. Prosecution evidence includes a video and photos of Aponick meeting in October 2003 with Borgesi's brother Anthony and the late Mauro Goffredo, then the owner of the trash company that employed Ligambi. The evidence list also includes "cards and letters" to Aponick from Borgesi and Borgesi's wife, Allyson. A year after his release, Aponick ended up back in jail after staging a series of bank robberies in the New York City area. But he managed to work a deal with the government based on his cooperation in the current case. Some sources believe his criminal past and credibility problems could keep him off the stand.